For those times when we have the entire Jeep sunrider soft top down on our 2004 Jeep Wrangler Unlimited, we use the Clover Patch Jeep Window Cover. The reason we like this one best, of all the other Jeep window covers out there, is because the Clover Patch is an all-in-one system — so everything stays in the Jeep! Yet it’s completely out of the way and you don’t even notice it’s there. We think it’s one of the best inventions ever for Jeeps with removable windows. We like knowing that our Jeep windows won’t be getting scratched when they’re not being used. Plus, the windows are always within reach, should we need to put the soft top and windows back on in the event of sudden rain storm. The Soft Top Window Roll Up Bag from Clover Patch is similar to a portfolio case for drawings & sketches in that it’s divided into “sections” and it rolls into itself, creating one compact storage bag for the Jeep’s removable windows. 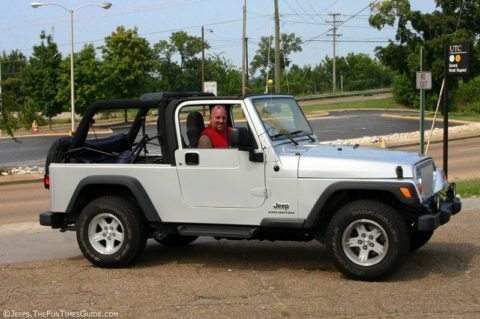 Once you’ve lowered the soft top itself, and tucked it neatly into the back of your Jeep (as it’s made to be stored while “down”), then you just wrap up the Jeep’s windows in the Clover Patch. 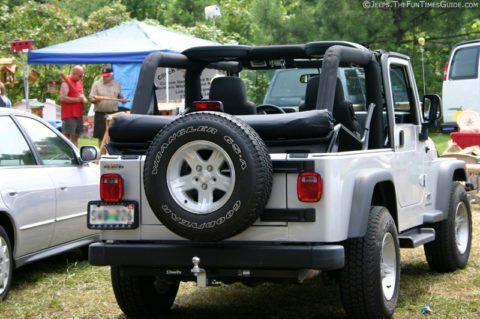 It rests right on top of the soft top itself and it attaches securely to the Jeep. This Clover Patch storage bag is sized to fit Jeep Wrangler windows (including the Unlimited) — 2 side windows and one rear window — perfectly between soft felt-like sheets that are sewn together and work as a system. Simply place each Jeep window between a separate felt-lined divider. Then, roll it all up into one long tube-shape. Next, place it in the vinyl protective cover (similar to a tent bag) and cinch the ends with the attached cords. Then, lie the entire thing over your tailgate/trunk area, resting it directly on top of your reclined soft top. Finally, secure it to the Jeep’s roll bars using the velcro straps that are attached to the outside of the bag. With the Clover Patch window cover, you can ride around with the top down — yet you’re always prepared for whatever Mother Nature might send your way!